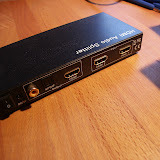 I’ve bought a HDMI Audio Splitter from dealextreme. I’ve ripped it open. The thing has two HDMI inputs, one HDMI output. So far it’s boring - most of these devices just use analog switches to route the HDMI. However, this thing also has a coaxial and optical SPDIF output. That means it must at least being able to parse the HDMI stream, potentially decrypt it (if HDCP is used), and extract the audio information. MEGAWIN MPC89L58AP - A flash-based 8051 microcontroller. It has 32kb of flash memory, from which 1kb is used for a bootloader to allow ISP functionality. A CAT6613 HDMI 1.3 Transmitter, that basically converts a stream of pixeldata to HDMI. It includes HDCP, color-space conversion, and also supports I2S-to-SPDIF. I don’t have any documentation on the two HDMI chips, so it would be necessary to reverse-engineer the protocol if you want to have some more fun with it. The same chip combination is also used in the THDB-HDMI Video Daughter Board, which is an addon-board to some FPGA. Figure 4.3 shows the reference code, which unfortunately doesn’t seem to be available in public… You can order it for $299 (including that hardware) though. More research required.